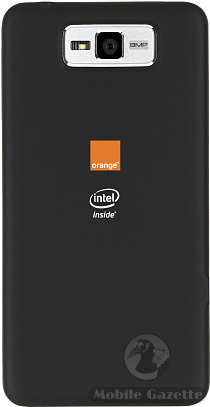 The Orange Santa Clara is the codename Orange's first Intel-powered Android phone, and it will be one of the first devices of its type to market during the summer of 2012. Orange is making a big fuss about the Intel CPU in the Santa Clara, saying that it offers "leading performance and energy efficiency". For anoraks amongst you, the handset is powered by the Intel Atom Z2460 with the Intel XMM 6260 Platform, whatever that means. Significantly though, this is a completely different processor from those based on the ARM core - which is just about every other smartphone in the world. 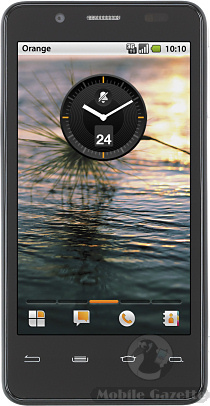 The handset is made for Orange by Gigabyte of Taiwan, rather than their recent partners ZTE. Unfortunately, Orange have missed a few key details from the specification sheet. We know that it has a 4.0" display, but we have to guess that the resolution is an unusual 1024 x 600 pixels because it has a 17:10 aspect ratio. We don't know the processor speed, but we guess it is about 1.6GHz (although clock speed isn't everything), and we don't know how much memory the Santa Clara has either (although we guess 1GB). What we do know for certain is that there's an 8 megapixel camera on the back, there's a front-facing video camera, 16GB of internal flash memory and presumably all the usual Android stuff such as 3.5G support, WiFi, Bluetooth and GPS. The Orange Santa Clara measures 123 x 63 x 10mm and weighs 117 grams. At launch the Santa Clara will run Android 2.3 with an upgrade to Android 4.0 promised. The Orange Santa Clara might not actually ship under that name, and Orange say that the commercial name will be revealed at the official launch. However, they have another popular Android handsdet called the San Francisco, so Santa Clara is a perfectly good name. Orange say that the Santa Clara (or whatever it will be called) should be available in the UK and France from this summer. No guidance was given on price.